The Engelmann prickly pear cactus (Opuntia engelmannii) can be easily identified by it's broad, flat, green pads. The white spines are 3" long and can be flat, curved or straight. They also are covered with tiny, barbed hairs known as glochids. Groups of up to 6 spines emerge from a common center areas known as areole's which are scattered around each pad. The flowers are yellow and emerge in May-June. Ripe fruit are found beginning in July and are identified by their bright red color. Prickly pear are found growing in washes, rocky hillsides, around boulders, and in areas where the soil is sandy or gravelly. The Englemann variety of prickly pear can be found over much of the desert southwest from central Texas through inland southern California. Their range extends into northern Baja California and into central Sonora, Mexico. They are known to live well over 20 years. There are several different varieties of prickly pear cactus each growing to different sizes. The most common species in the Sonoran Desert is the Engelmann prickly pear which grows up to 5 feet tall and can grow to a width of 10-15 feet. The red fruit or pear of this cactus are also known as "tuna". 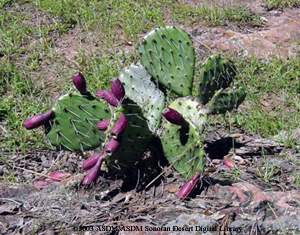 Prickly pear are the state cactus of Texas. Packrats often build dens at the base of these plant, which then provides protection from some of its predators.